My ode to all the hard working, hard loving mama's out there! 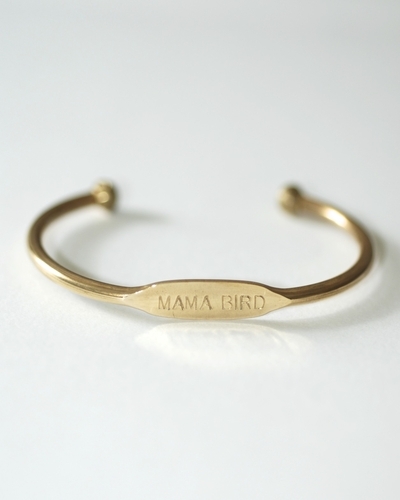 This handcrafted bracelet will make the most perfect gift for the "Mama Bird" in your life. MAMA BIRD is single letter, hand stamped on a solid brass bracelet about 2.5 inches wide with a 1.25 inch opening that is slightly adjustable. 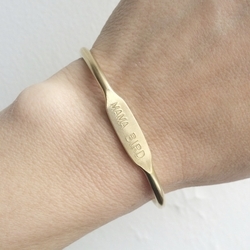 Because this bracelet can be squeezed smaller or opened wider it fits a variety of wrist sizes. 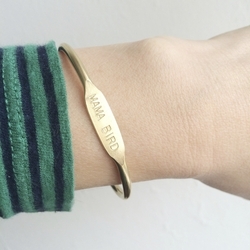 The lettering on each bracelet is done by hand and therefore no two bracelets will be identical giving your bracelet that special and unique handcrafted quality. This bracelet looks great on its own or stacked up and surrounded by multiples (see other options including an initial bracelet to compliment this).